Enter your [User Code] and press the [OFF] key to silence the alarm (or warning tones of a memory of alarm). Note the zone in alarm on the keypad display, and make that zone intact (close door, window etc.). Now enter your [User Code] and press the [OFF] key again to clear the alarm memory. If the display will not clear, Troubleshooting required. NOTE: A Burglary alarm is a continuous/ steady sound. NOTE: A Fire alarm is an interrupted/ pulsed sound. If your system supports “Quick arming”, the [#] key can be pressed in place of the security code when arming the system. NOTE: The security code is always required, however, when disarming the system. Your system has preset time delays, known as exit delay & entry delay. When you arm your system, exit delay gives you time to leave through the entry/exit door without setting off an alarm. Entry delay gives you time to disarm the system when you re-enter the through the entry/exit door. The system must be disarmed, however, before the entry delay period ends, or an alarm will occur. The keypad will beep slowly during the entry delay period, reminding you to disarm the system. You can also arm the system with no entry delay at all by using either INSTANT or MAXIMUM arming modes. These modes can provide greater security while you are sleeping or while you are away for extended periods of time. When arming AWAY or MAXIMUM, slow beeps will sound from the keypad (s) during the exit delay, turning to fast beeps during the final five seconds of the exit delay time. NOTE: Remember, there will be no ENTRY delay when arming with INSTANT or MAXIMUM. Before arming your system, all protected doors, windows and other protection zones must be closed or BYPASSED, otherwise the keypad will display a “Not Ready” message, and if your keypad has a READY indicator light, it will not be lit. The READY key can be used to display all faulted zones, making it easier for you to secure any open zones. Secure or bypass faulted zones displayed before arming the system. A “Ready” message will be displayed and the keypad’s READY indicator light (if present) will be lit. The system can then be armed, if desired. Bypassed zones are unprotected and will not cause an alarm if violated while your system is armed. All bypasses are removed when an OFF sequence ([User Code] plus [OFF]) is performed. This key is used when you want to arm your system with one or more zones intentionally unprotected. The system must be disarmed first. Enter your [User Code] and press the [BYPASS] key. When finished, the keypad will momentarily display a “Bypass” message for each bypassed zone number. Wait for these zones to be displayed, to confirm their bypass. Arm the system as usual. If your system supports “Quick Bypass”, it allows you to easily bypass all open (faulted) zones without having to enter zone numbers individually. This feature is useful if, for example, you routinely leave certain windows open when arming at night. To use this feature, enter your [User Code], press the [BYPASS] key, then wait, in a few moments, all open zones will be displayed along with a “Bypass” message. Wait for all bypassed zones to be displayed, then arm the system as usual. 1. Enter the Master Code + [#] +  , or if programmed, press the designated function key. The system lets you view it’s Time & Date setting. The display remains on for about 30 seconds. 1. Enter the Master Code + [#] +  , then press [*] while the Time & Date is displayed. A cursor appears under the 1st digit of the hour. NOTE: To move the cursor ahead, press [*]. To go back, press [#]. 2. Enter the 2-digit hour setting; enter the 2-digit minute setting. 3. Enter the last two digits of the current year. 4. Enter the 2-digit month setting (01-12), enter the 2-digit day setting (01-31). 5. Press [*] to accept the settings and continue. The Clock Adjustment prompt is now displayed. This prompt lets you add or subtract up to 59 seconds per day, if needed, to keep the real-time clock accurate. 1. Press  to add seconds per day, or press  to subtract seconds per day. 2. Enter the desired number of seconds per day (01-59) to add or subtract. 3. Press [*] to accept the settings and exit. This mode automatically exits after 10 seconds. 1. Enter your [User Code] and press the [OFF] key. When activated, three tones will sound at the keypad whenever a door or window is opened. Pressing the [READY] key will display the open protection points. This feature can only be used when the system is disarmed. Enter the [User Code] and press the [CHIME] key. The CHIME message will appear. The CHIME message will disappear. Your system may have been programmed to use special keys to manually activate panic functions. The functions that might be programmed are listed below. See your installer for the function (s) that may have been programmed for your system. Your installer should note the functions that are active in your system. To use a paired key panic function, simply press both keys of the assigned pair at the same time. If your keypad has lettered keys for panic functions, press the designated key and hold down for at least 2 seconds to activate the panic function. Sends an alarm signal to the alarm monitoring company, but there will be no audible alarms or visual displays. 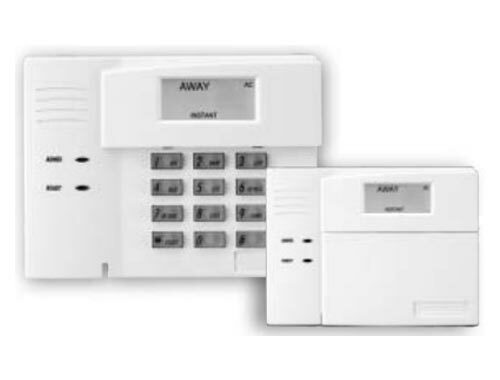 Sends an emergency message to the alarm monitoring company and sounds a loud, steady alarm at your keypad and at any external sounders that may be connected (“ALARM” plus a zone number are also displayed). Alarm sends an emergency message to the alarm monitoring company and sounds at keypads, but not at external sounders. (“ALARM” plus a zone number are also displayed). Sends a fire alarm message to the alarm monitoring company and uniquely activates keypad and any external sounders (“FIRE ALARM” plus a zone number are also displayed). 1. You can silence the alarm at any time by pressing the [OFF] key (the user code is not needed to silence fire alarms). 3. If the keypad’s fire indication does not clear after the second OFF sequence, smoke detectors may still be responding to smoke or heat producing objects in their vicinity. Investigate, and should this be the case, eliminate the source of heat or smoke. 4. If this does not remedy the problem, there may still be smoke in the detector. Clear it by fanning the detector for about 30 seconds. Should you become aware of a fire emergency before your detectors sense the problem, go to your nearest keypad and manually initiate an alarm by pressing the appropriate panic key (s), assigned for FIRE. operation. No alarm reports will be sent to the Central Monitoring Station while in TEST Mode. displayed and the READY indicator (if present) should be lit. As the test mode is entered, the external bell or siren will sound for 2 seconds then turn off. Each time a protection zone is faulted, the keypad sounds 3 beeps. The keypad will sound a single beep every 40 seconds as a reminder that the system is in TEST mode. identification of each faulted protection point should appear on the display. Walk in front of any interior motion detectors and listen for the required sound as movement is detected. The identification of the detector should appear on the display when it is activated. NOTE: Wireless PIR units will send signals out only if they have been inactive for 3 minutes. Follow the manufacturers instructions to test the smoke detector, to ensure that all are functioning properly. The identification of each detector should appear on the display. Turn off the TEST mode by entering the [User Code] and pressing the [Off] key. To silence the beeping for these conditions, press any key. environment that prevents the receiver from hearing a particular sensor. 3. If you cannot correct a “CHECK” display, or if it is for a fire zone, service will be required. Words or letters in parentheses ( ) are those that are displayed on Fixed-word keypads. not operate while on-line. Wait a few minutes. The display should disappear. AC LOSS (or NO AC) The system is operating on battery power only due to a power failure. Busy-Standby (or DL) If this remains displayed for more than 1 minute, system is disabled. Service is required. OPEN CIRCUIT (or OC) The keypad is not receiving signals from the panel. Long Rng Trbl (or bF) If programmed, back up long range radio communications has failed. Service required. battery) for the system has stopped and the system is in-operative. Service required. alarm or audible emergency alarm). Accompanied by the protection zone in alarm. AWAY: All burglary zones, interior and perimeter, are armed. INSTANT: Perimeter burglary zones armed and entry delay is turned off. FIRE: Appears when a fire alarm or fire fault is present. Accompanied by a display of the zone in alarm. NO AC: Appears when AC power has been cut off. System is operating on back-up battery power. CHIME: Appears when the Chime feature is activated. MESSAGE: Appears when a message has been recorded and has not yet been played back. BYPASS: One or more burglary protection zones have been bypassed. NOT READY: Appears when burglary portion of the system is not ready for arming (due to one or more open protection zones). READY: The burglary portion of the system is ready to be armed. At the time of installation, your installer programmed a personal 4-digit master code. This code is used to perform most system functions, including arming/ disarming of the system. As an additional safety feature, temporary user codes can be assigned for use by those not having a need to know the Master code. NOTE: When performing any of the procedures that follow, do not allow more than 2 seconds to elapse between steps, otherwise the entry will be aborted, and the procedure must be repeated from the start. Enter your [Master Code] and press the [Code] key. Enter the desired [4-digit code] for use by that user number. The keypad will beep once when a user code has been successfully entered. Enter your [Master Code] and press the [Code] (8) key. Enter the single-digit User number for whom a code is to be changed. Enter the double-digit User number for whom you want to change. Enter the two-digit User number for whom a code is to be changed. Vista 10 – Enter your [Master Code] and press the [Code] key. Vista 20 – Enter your [Master Code] and (Code) (8). Enter the User number of user to delete and then stop. In a few moments, the keypad will beep once, indicating that the existing code has been deleted. Enter the double-digit User number for whom a code is to be deleted. Press the [#] and then  buttons. Vista 10 – The Duress code may be any 4-digit code assigned to user 8. Vista 12 – The Duress code may be any 4-digit code assigned to users 4-17. Vista 20 – The Duress code may be any 4-digit code assigned to user 16. Vista 48 – The Duress code may be any 4-digit code assigned to users 4-24/26-40/42-49. Enter your [Master Code], press  twice then enter the 4-digit [Duress Code]. Enter the double-digit User number for where the duress code is to be allocated. Press the [#] and then  and then  buttons. Enter   for user 16 – duress code. Enter the 4-digit [Duress Code]. The keypad will beep once. Vista 12 & 48 – See ‘To Change a Code’ above but enter the Duress code User number. Vista 201. Enter your [Master Code], press the  key. 2. Enter   for user 16 – duress code. 3. Then stop. When the keypad beeps once it signifies that the code has been deleted. Enter your new [Master Code] again.